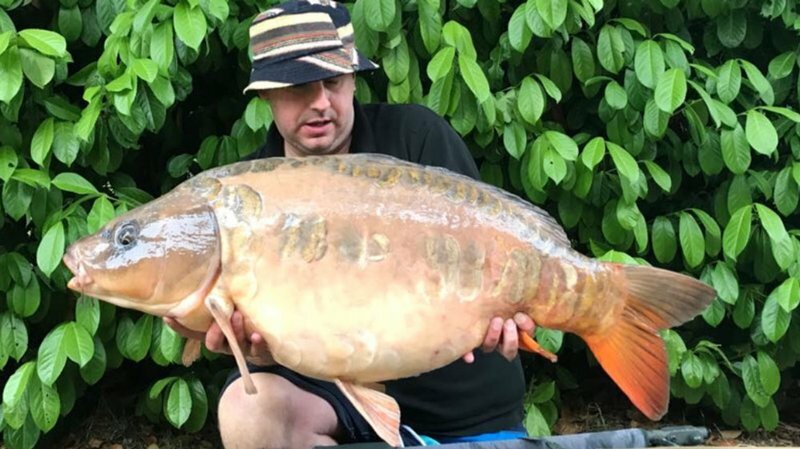 I was going to focus this week’s update by talking about Jacob Gale’s great session on Cherry Springs last week but given Matthew Blinston’s results over the last 24 hours, he has to ‘share the glory’! Jacob was fishing last week in Kingfisher Lodge on Cherry Springs for the first time. His words from his e mail to me sums his trip up succinctly “I really enjoyed my stay at Cherry Lakes and had 13 fish in total. I am sure I’ll be back again soon”. His two biggest were a night caught Mirror of 26-04 and this stunning ‘Linear’ below of 21-02. What a cracking fish. Well done Jacob. Matthew Blinston has been on a return trip to Cherry Lake Cottage with his family this week. Matthew has been principally fishing over-night and into the morning. Family trips meaning his swim gets a rest for much of the day. This tactic often seems to work. The last 24 hours has been good to Matthew as he has landed good looking Carp of 21-02, 27-04 (see below) and ‘The Peach’ at 31-14. In doing so, Matthew became the 104th member of the Cherry Lakes 30+ club. We are extremely pleased to see ‘The Peach’. 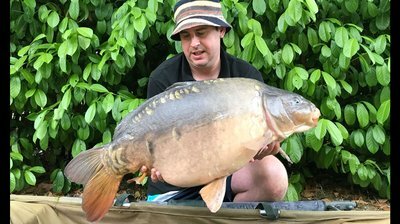 She is a much sought after Ghost Mirror, and this is the first time she has been landed over 30lb’s. This brings our total of properly photographed and weighed Carp over 30lbs+ this year to 19. The Peach was last caught by Neil Ash in April this year at 29-06. Comparing photos shows just how much she has grown over this period and looks even bigger than the very honest 31-14 that she was weighed at. As I mentioned in my last update, the Cherry Lake Carp have been on the feed for the last few weeks and we have responded by feeding heavily during the twice weekly change over periods (Judith says the Carp are like me…..the more I eat….the more I want)! This has resulted in our upper twenties not only recovering from spawning but also putting on weight. As well as being very evident in ‘The Peach’, the fact we had three other new 30′s last week augers extremely well for the future. I might even have to revise up my view that we have at least 25 Carp over thirty pounds in Cherry Lake at the moment. With several more months of good feeding time left, the Carp should continue to grow and put on weight . I expect the lake record of 40-04 to be broken over the next six months. Time will tell! Matthew Blinston with a 27-08 Cherry Lake Mirror which has clearly been on the feed!